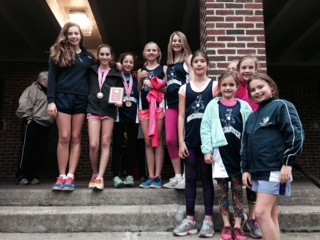 This year’s 8 person XC team had an incredible showing at yesterday’s Annual 1.5 mile Diocesan Championship XC Meet. Our team placed 5th overall and brought home FOUR “All Catholic” titles. 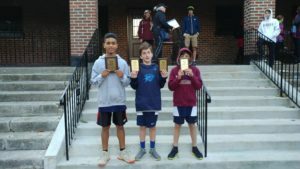 The team’s breakout runner – Isaiah S placed 4th in the boy’s division with a season best time of 9:42 and 8th grader Finn Cl placed 10th with a season best time of 10:00, beating out top runners from St. Augustine, St. Greg’s and Nativity. 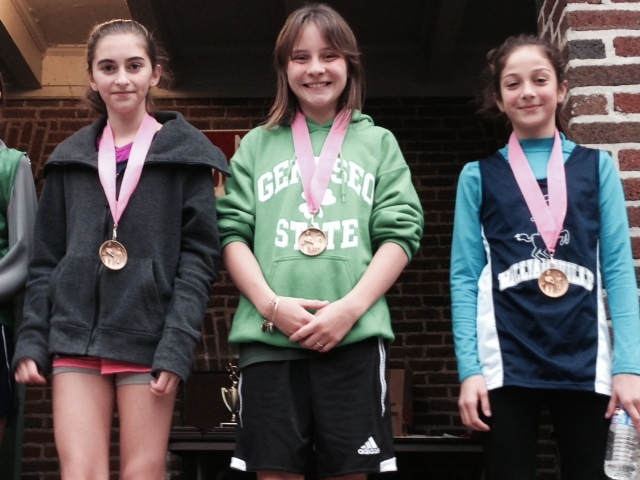 The girls brought speed and strength to this year’s course with 8th grader Amelia M placing 9th with a time of 10:43, followed by 7th grader Genevieve B with a time of 10:46 – placing 10th overall, beating out top runners from St. Greg’s and Nativity. All four runners were named “All Catholic,” in an awards ceremony immediately following the race. 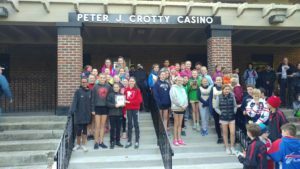 Congratulations to 7th graders Cassidy M and Mariah S and 6th grader Antonio S who finished strong with personal best times in yesterday’s meet, and special recognition to Macey K who wasn’t able to attend this year’s meet, but helped the team score points to place SSPP in the top five schools for the league. This season’s victories were hard fought for such a small team and each runner worked hard every week in practices and at meets to gain personal improvement and a win for SSPP. The team practiced three times a week in preparation for each meet, weathering cold temperatures, harsh winds and sometimes rain to improve their times. 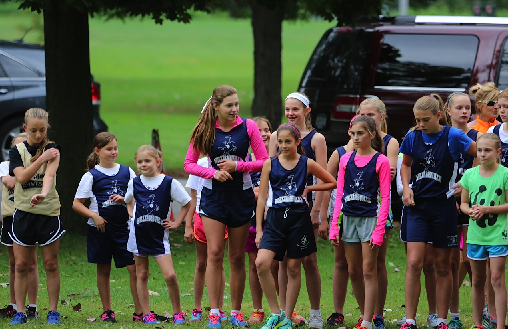 This season’s 9 XC runners are proof that if you believe it – you can achieve it. Congratulations to each and every runner for their dedication and perseverance in edging out some of the league’s fastest runners to bring home the hardware for SSPP. We ended our Cross Country Season on Monday and although we did not place in the top 7 schools, each runner did a great job personally- all decreasing their time week after week. Colin M placed 8th overall for the boys with a time of 9:46 and earned himself a league award! 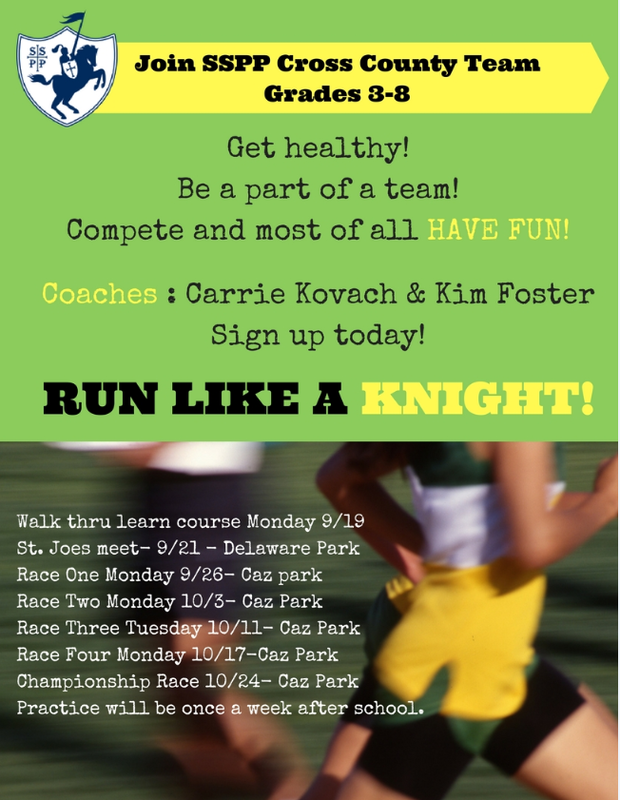 Each runner decreased their time week after week- working harder and getting faster. At each meet and practice, we gave out a “You Rock” award- to someone who pushed themselves harder, displayed leadership/team player and a positive attitude. Every single runner could have received the award! Despite being the smallest team. competing, we always showed up and proudly represented SSPP. Well done! 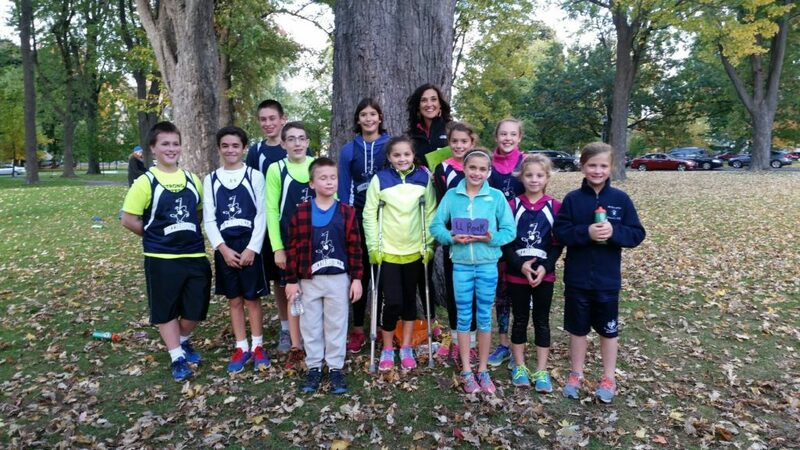 Our cross country team participated in the St. Joe’s Mike Diggins Memorial meet yesterday at Delaware park. Every teammate should be proud of themselves…everyone completed the race under the maximum finish time of 20 minutes! 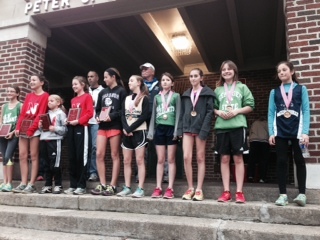 The girls placed 5th overall – and Genevieve B placed 5th for her age group. All the girls did an awesome job and made their coaches proud. Claire T earned herself the “You Rock” award for showing up, telling the coaches she was ready and that she was going to try to run the whole thing! She did – and when it started to get tough at the end- she dug deep, and continued to run all of the hills and to the finish line! Way to go Claire! You did it! Colin M won 1st for his age group.. Way to go Colin!! You Rock! You paced yourself and stayed in front for the race! Harry M and Alex S ran hard and pushed themselves up the hills and proved they had it in them! All 3 finishing with great times! -all their hard work and practice paid off! Their next meet is on Monday. 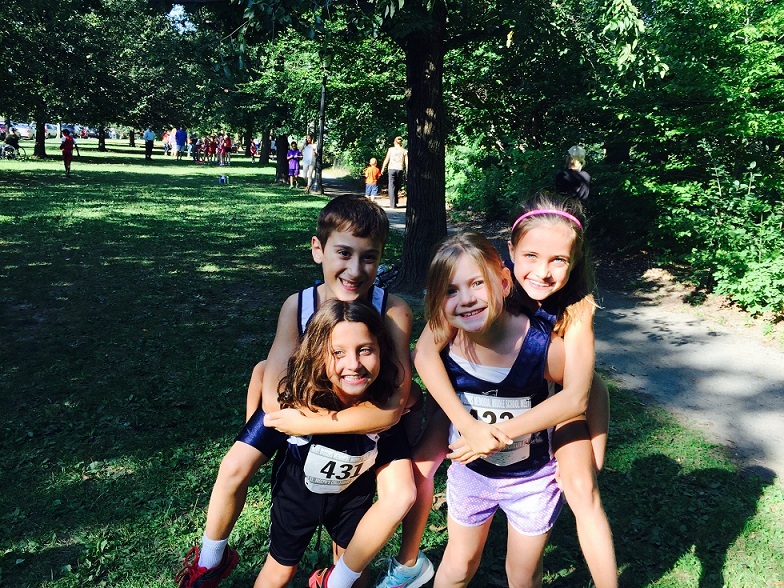 Our Cross Country team participated in the St. Joe’s Invitational Cross Country Meet yesterday. Congratulations to Lizzie V who placed in the top ten for girls 6th-8th grade and Colin M who placed in the top ten for boys 6th-8th grade. 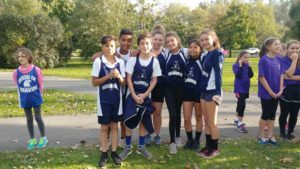 Strong running was done by Marisol B, Genevieve B, Carly A, Macey K, Cara M, Henry W, Matthew S, Michael O, Alex S and Andrew M.
The Cross Country team wrapped up its season yesterday with the very competitive All-Catholic Championship Meet. Our girl’s team placed 3rd overall yesterday out of 11 teams! 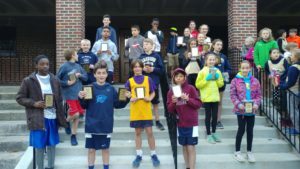 Runners recording personal best times are: Derek B, Aaron R, Matthew R, Margaret W, Lizzy V, Nicole M, Liesl D, Anne-C M, Cara M, Amelia M, Macey K, Marisol B, and Sophia V.
Two runners earned All-Catholic awards for finishing in the top 10 out of 100 runners yesterday in the girl’s race: Margaret W and Lizzy V. Nicole M finished just out of the medals in 11th place. The top 2 boy’s race finishers were Derek B in 16th place out of 118 boys and Joseph R who finished in 34th place. Third and fourth place finishers for SSPP were Joseph D and Henry W.
Congratulations to all the runners. The rest of the team members are Ian J, Nicky Q, Sarah F, Kennedy K, Brooke B, Ceci B, Elizabeth F and Laura B. 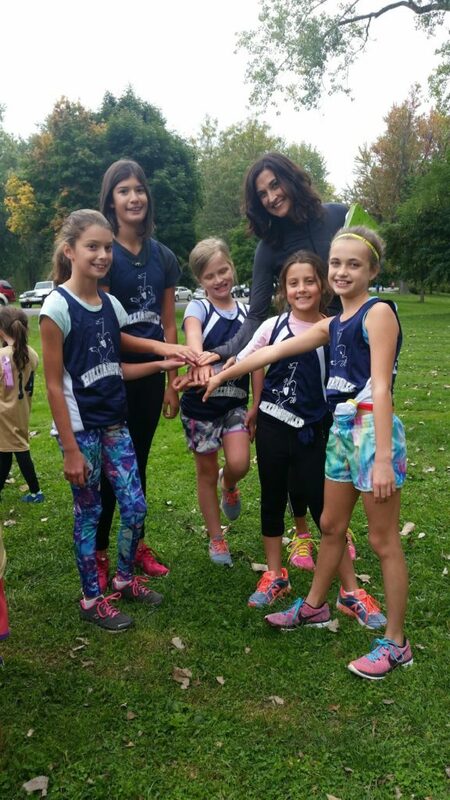 The team is coached by Mrs. Bartlo. Congratulations, also, to our girl’s team that also brought home an award for placing 2nd overall for the season out of 11 teams. 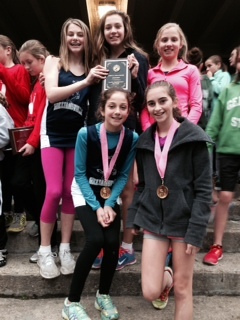 Five of our SSPP cross country runners finished in the top 15 at this week’s meet. They are Nicole M, Lizzy V, Margaret W, Sarah F, and Derek B. Congratulations! 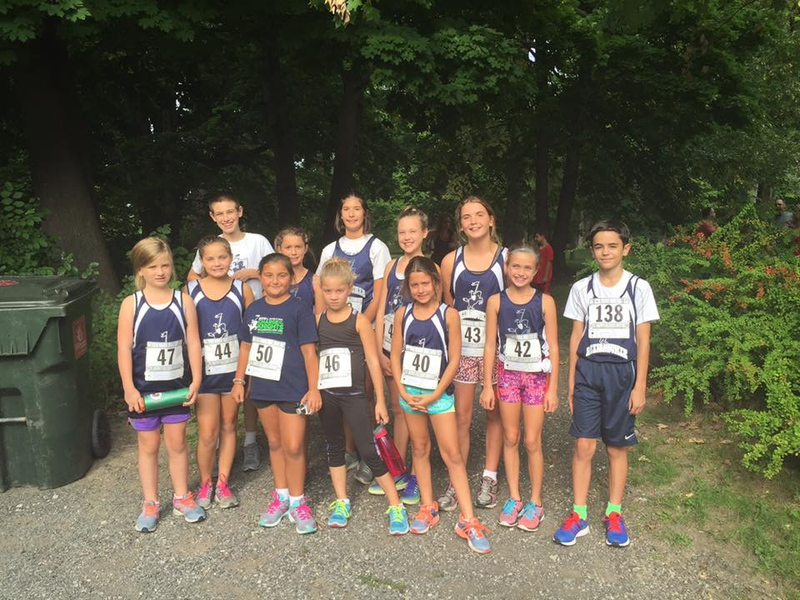 The SSPP Cross Country team had a great meet yesterday. Three of our girls finished in the top 10 out of 120 female runners. Margaret W finished 7th, Lizzy V finished 8th and Nicole M finished 9th overall!!! In addition, Derek B finished in 25th place in the boys race out of 150 runners. Congratulations to the boys and girls cross country team for a great day at the St. Joe’s Middle School Invitational yesterday. The girls team finished second overall out of 7 teams. 3 girls finished in the top 10. They were Margaret w, Lizzy V and Sarah F. Great job!! !